3 more inches, that’d be sweet? (for those on the metric system, that’s about 7.6cm). It’s pretty huge and although this shampoo and conditioner doesn’t exactly promise spectacular hair growth, it does state that it’s haircare for hair. Anyway, I was in Mecca (when am I not?) and saw this product and wanted to give it a whirl. I never really spent money on shampoo because I always thought ‘what’s the point?’ These babies don’t come cheap either. Regardless, I’ve been struggling with hair growth/thinning hair for a while and tried everything under the sun, cough Regaine cough. I have since realised my hair growth was slowed, because I had been sick for a long time and the stress of being ill, impacted my hair growth to the point that Adrian was noticing how fine and sparse it was becoming (I’m talking I could pin it with one bobby pin, thin). 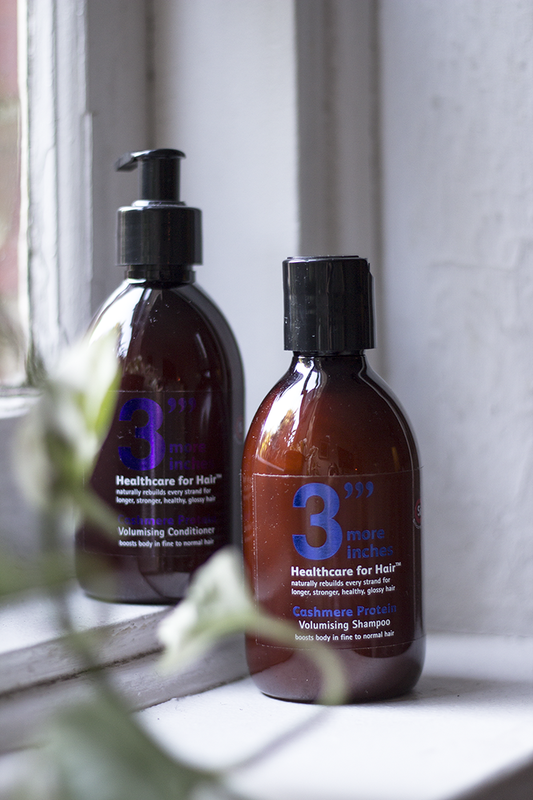 What 3 More Inches promises to do, is basically ‘fill in the gaps’ of your broken hair strands, with cashmere proteins. So your hair can continue on growing, without all the breakage. With 3 More Inches now in my arsenal, I was pretty stoked to give it a red hot go. The shampoo is great, smells nice, rich lather and a little goes a looong way. However, I’m a conditioner girl and this conditioner isn’t like anything I’ve ever used. The consistency of the 3 Inches More conditioner is pretty watery and I was skeptical as to whether my hair would even be manageable after I dried it. However, I was pleasantly surprised! When I was rinsing my hair, I could feel it soften and become really silky. After using the shampoo and conditioner for about one and a half months, I started noticing how much thicker it was feeling in a pony tail. I began annoying Adrian, asking him to touch it every now and then, just in case I was going crazy. He too, felt a change! I would style my hair like usual and at one point, my hair felt the way it would after you’ve gone to the hairdressers, I was on cloud nine! I even booked in a trim because I noticed my ends were looking tatty and my hair had actually grown! (not dramatically but noticeably for me). So, with all this hoo-ha comes the moo-lah. I was in the shower and started doing the maths for an estimated cost per use. I worked it out to be around $2 per use. (Based on using the shampoo and conditioner three times a week, for about 3 months and $74). Also, I started using this in August and it’s now late October, so I’m teetering on four months. (To prolong the shampoo, because I’ve been tight, I have switched shampoos here and there after using it for a month straight). I mean, there are obviously cheaper shampoo and conditioners out there. But, if you were like me and needed a little help, I would recommend this.